What is "depraved heart" murder? BALTIMORE - Of all the charges filed against six Baltimore officers indicted Friday in the death of Freddie Gray, the top count is second-degree depraved heart murder, which carries a maximum sentence of 30 years in prison. In Maryland, depraved heart murder is "the killing of another person while acting with an extreme disregard for human life." John Jay College of Justice Professor Delores Jones-Brown, the author of "Race, Crime and Punishment," told 48 Hours' Crimesider that the charge indicates an "extreme form of recklessness." "You so disregarded the welfare and well-being of this person that we will treat it like a murder," she explained. Scott Patterson, the State Attorney for Talbot County, Maryland, said that depraved heart murder is often used when the defendant caused a victim's death "without showing explicit intent to kill." He used the example of someone shooting a gun at cars: "The person may not have intended to kill anyone," but his behavior exhibits "an element of viciousness or disregard for human life." According to jury instructions for the charge, in order to convict the defendant of depraved heart murder, the State must prove not just that the defendant's actions caused the death, but that "the defendant's conduct created a very high degree of risk to the life" of the victim, and that "the defendant, conscious of such risk, acted with extreme disregard of the life-endangering consequences." Officer Caeser R. Goodson, Jr., is charged with second degree depraved heart murder, as well as involuntary manslaughter, second degree assault, and manslaughter by vehicle. In announcing the indictments Friday, State's Attorney Marilyn Mosby said that Lt. Brian Rice, who is charged with involuntary manslaughter, second degree assault and false imprisonment, told Goodson to transport Gray to central booking after he had been cuffed and placed in the back of a police van on April 12. But, according to Mosby, "despite obvious and recognized need for medical assistance, Officer Goodson in a grossly negligent manner chose to respond to [another call] with Mr. Gray still unsecured by a seat-belt in the wagon without rendering or summoning medical assistance for Mr. Gray." Mosby said the medical examiner concluded Gray's death was a homicide believed to be the result of an injury sustained while in police custody. While cuffed in the back of the van, Gray repeated asked for medical assistance and officers repeatedly failed to render it, Mosby said. 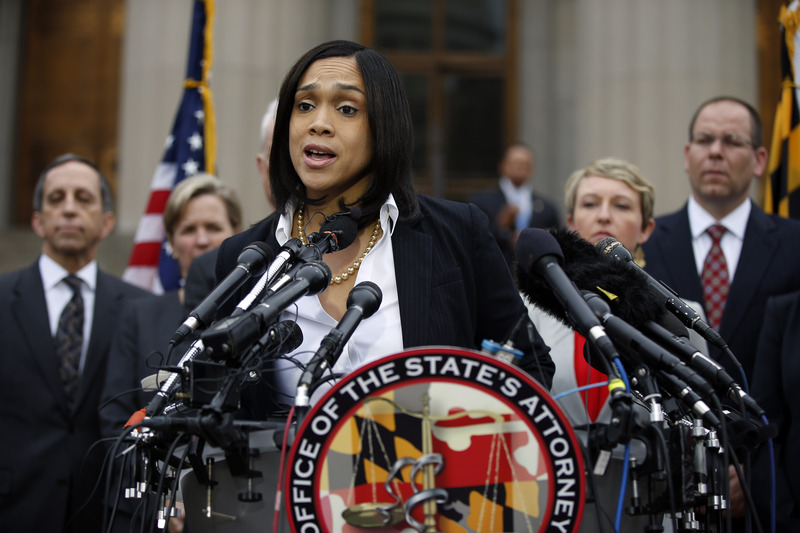 Former NYPD officer and prosecutor Eugene O'Donnell told Crimesider Friday that he thought Mosby may have overcharged the officers and that the cases against them were "far from a slam dunk."